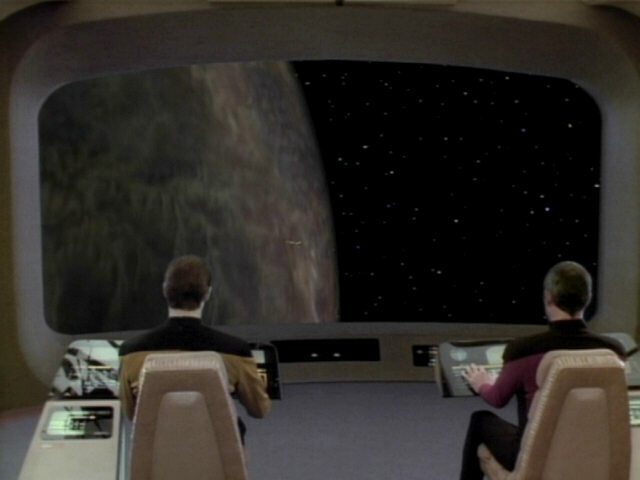 Ex Astris Scientia - Observations in TNG: "Legacy"
Here are some observations about sets, props and visual effects in TNG: "Legacy" without a specific theme, and a comparison of the original TV release (TNG) with the remastered episode (TNG-R). 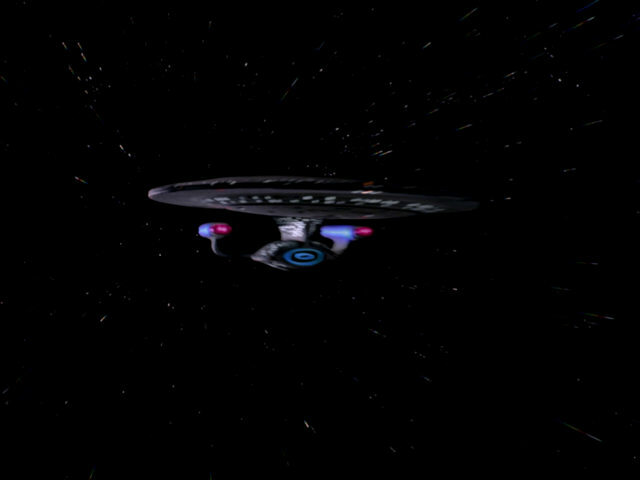 Enterprise Flybys in TNG and TNG-R Like in "Brothers", this shot appears very blurry in the remastered version of the episode. 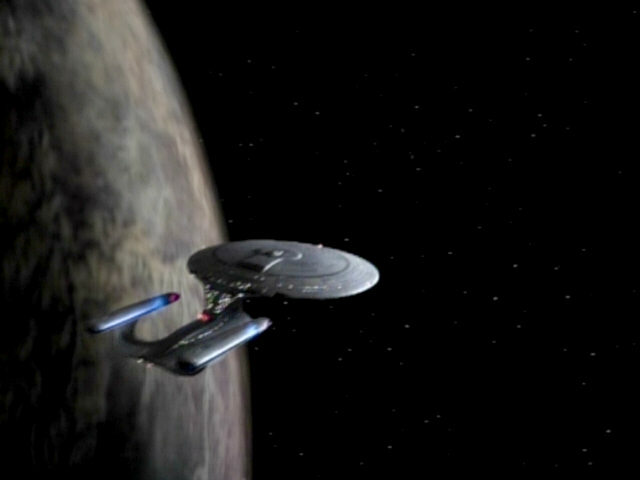 It is a shot of the Enterprise flying into the opposite direction that was mirror-inverted, as the shot from the original episode was missing. 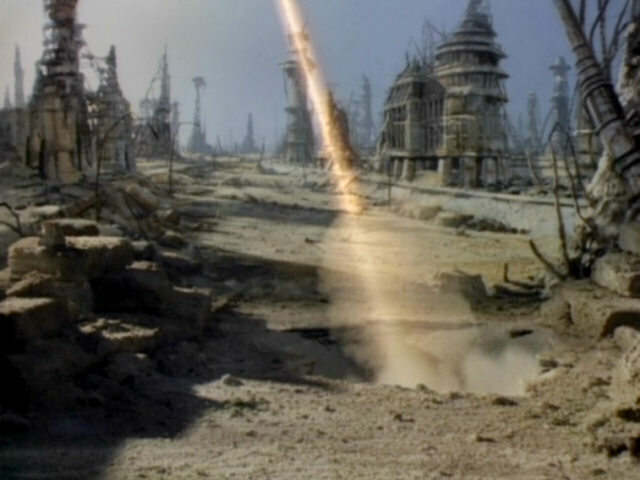 The Arcos can be seen briefly before it explodes. 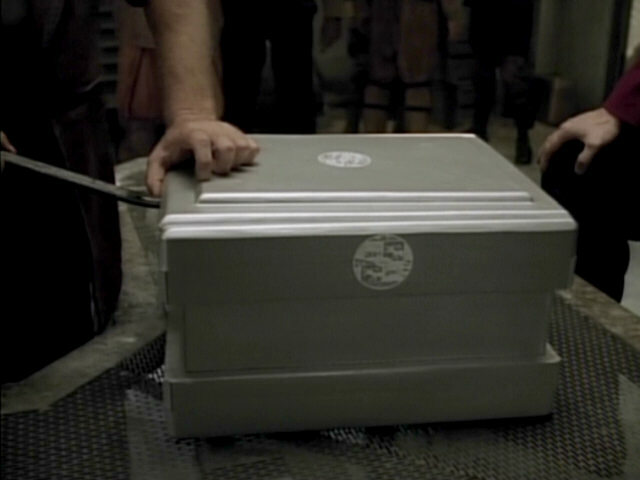 In the original episode, it was impossible to make out what model was used to represent the Arcos. 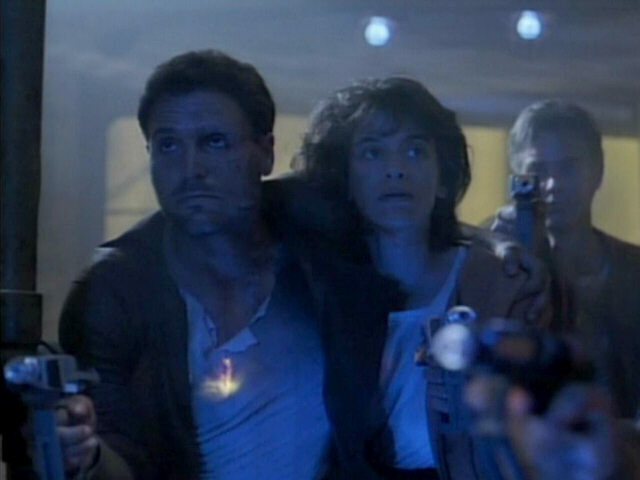 A microphone can be seen at the top of the screen in this scene. 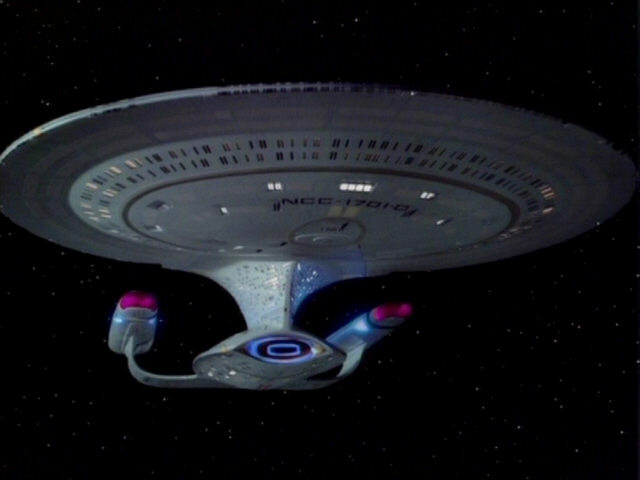 In the remastered version, it can be seen for the first time that the model of the Sanction/Erstwhile was used. 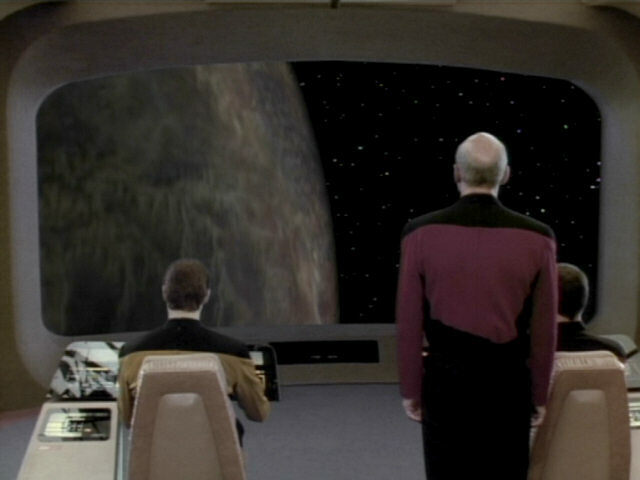 The microphone is still visible in this scene with Picard in front of the main viewscreen. 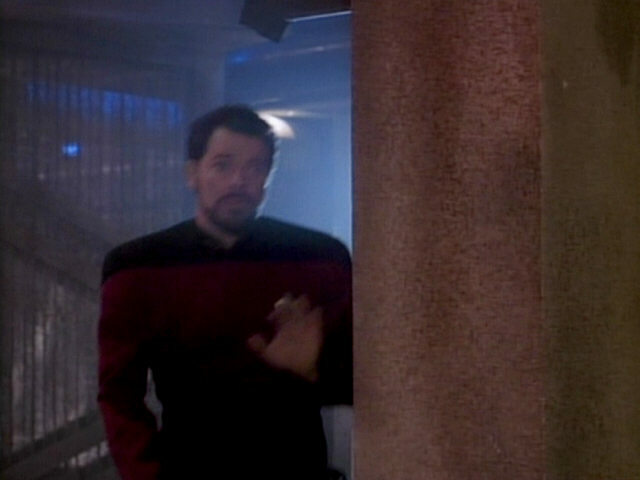 No microphone can be seen in TNG-R. 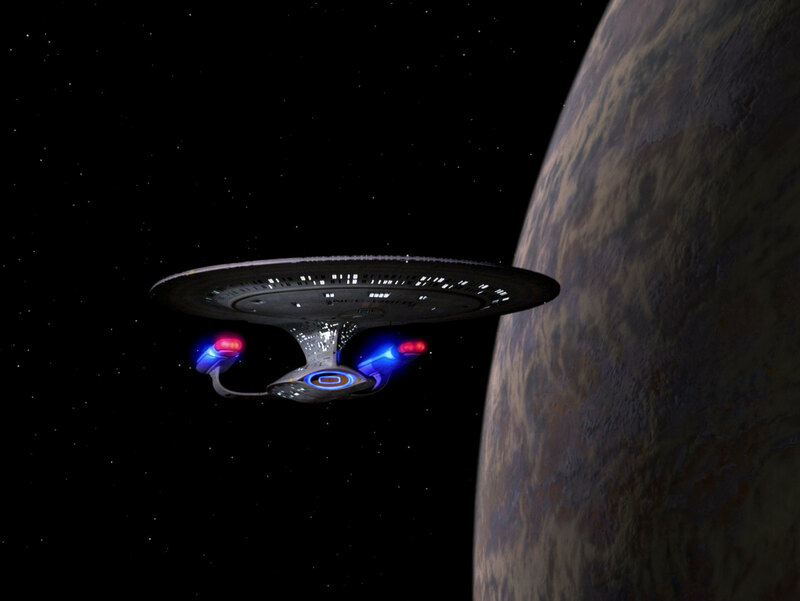 The USS Enterprise-D in orbit of Turkana IV. 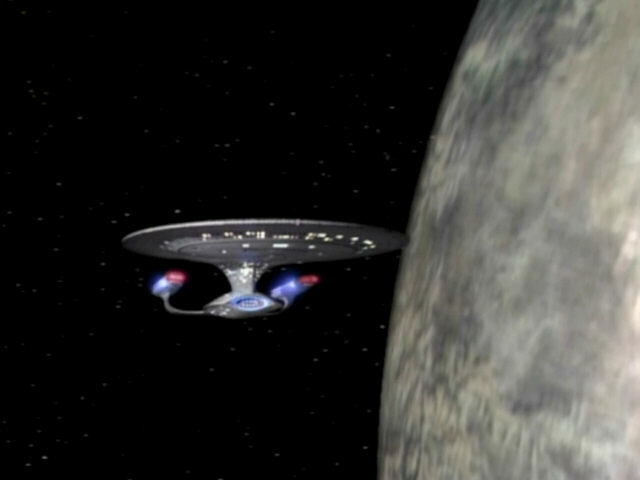 The planet was first seen as Delta Rana IV in "The Survivors" and appeared only a few episodes ago as the Starbase 416 planet. 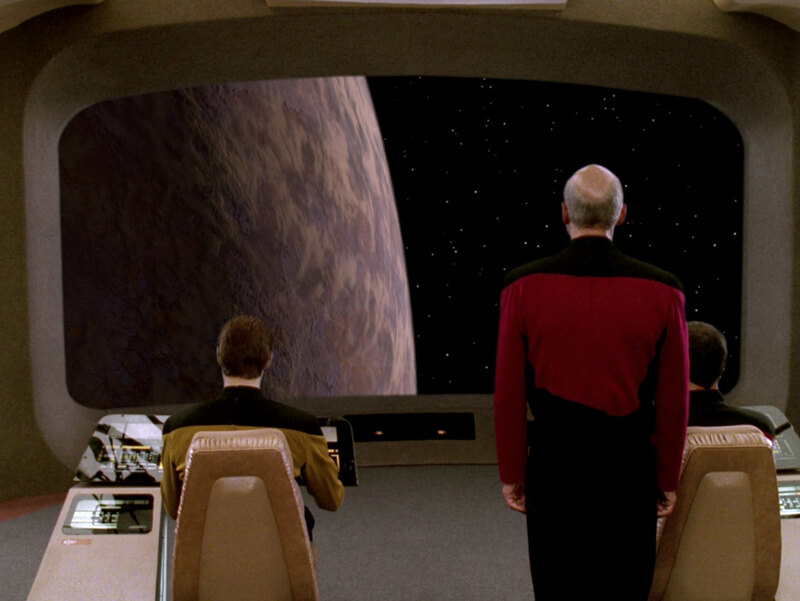 Re-Used Planets in TNG The planets in TNG-R: "The Survivors" and TNG-R: "Legacy" are identical just as in the original episodes. 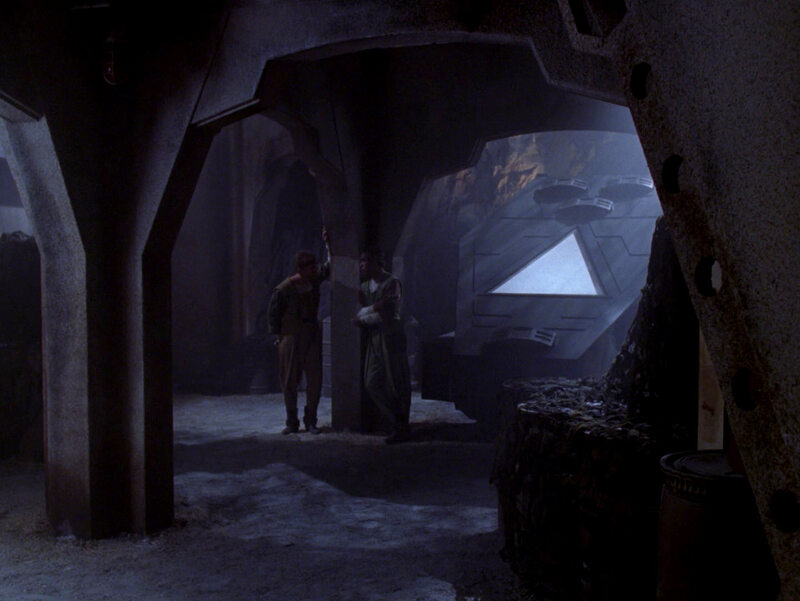 The surface of Turkana IV is realized using a matte painting and some rocks and sand in the foreground. 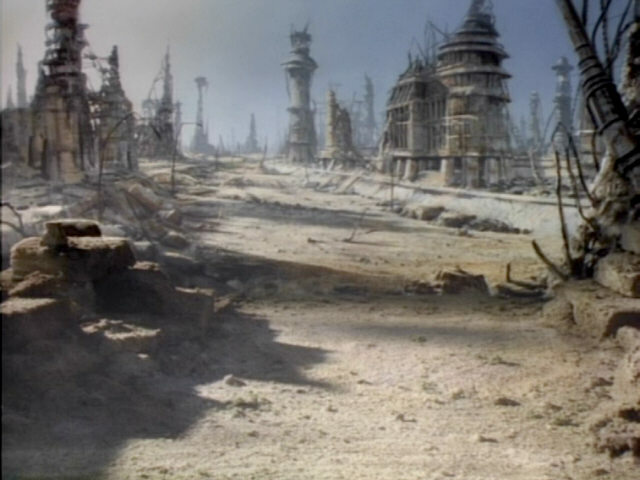 The matte painting (with additional rocks and a new building in the foreground) was re-used as T'Lani III in DS9's "Armageddon Game". 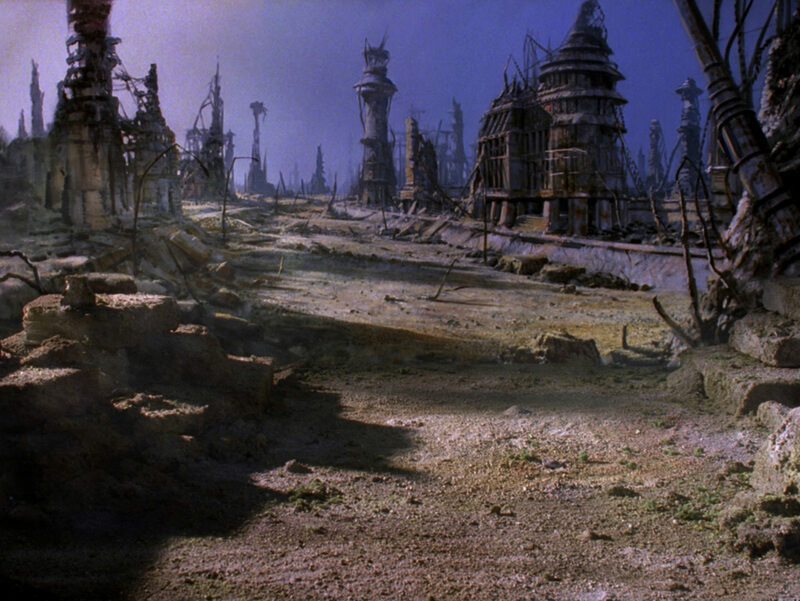 Footage of this modification of the matte painting was also briefly seen in VOY's "Unity". 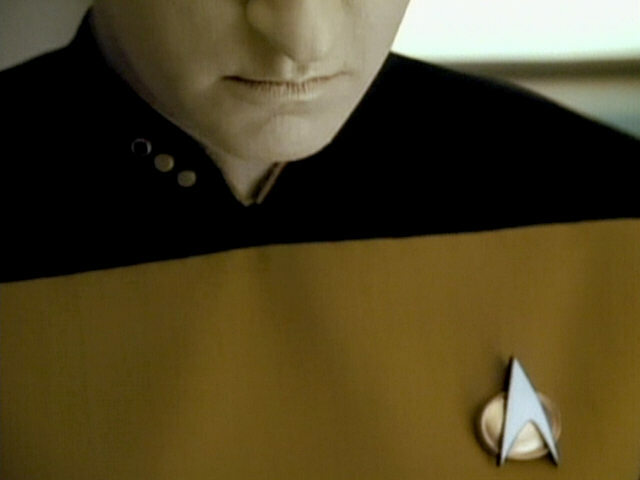 The previously very pale matte looks a lot better in TNG-R. 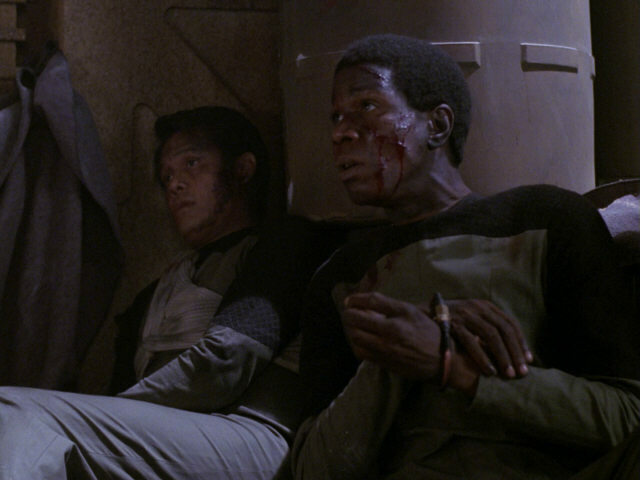 The pistols used by members of the Coalition and Alliance on Turkana IV were also used by the Ansata terrorists in "The High Ground". 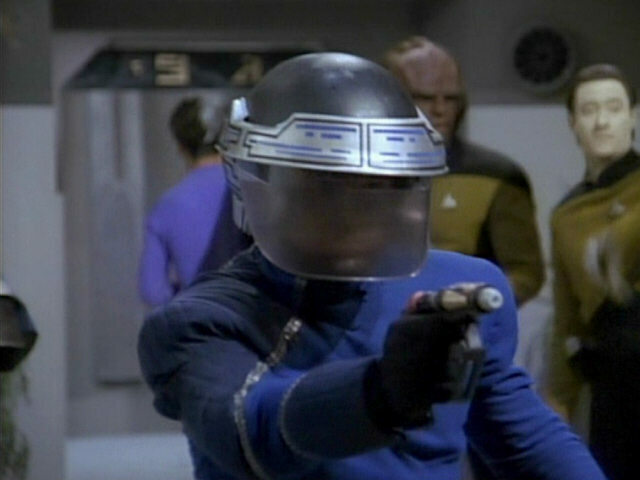 The weapons appeared in several later TNG, DS9 and VOY episodes. Ground" An HD close-up of the weapon. 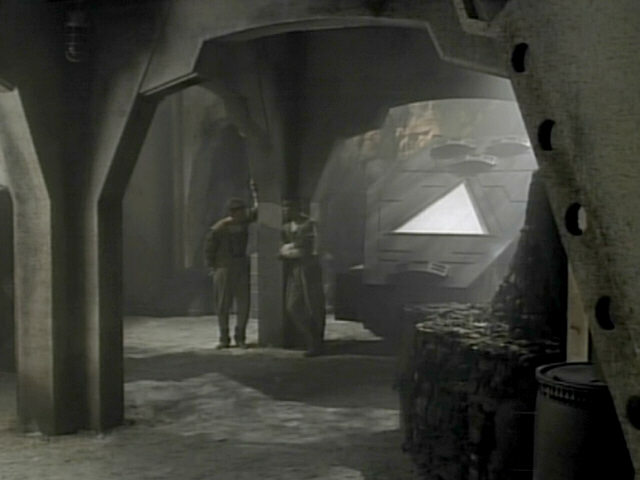 Some of the walls of the Turkana IV tunnels were originally seen on board the Borg cube in "The Best of Both Worlds I+II". The logo on the crate of Telluridan synthale. The logo can be seen much better in HD. 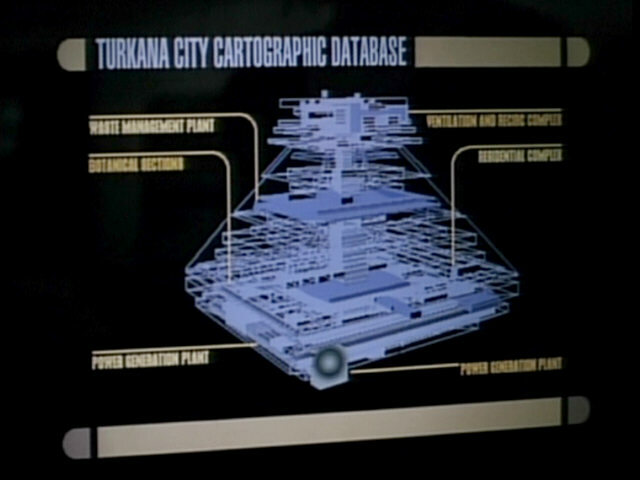 This episode features several different computer displays of the underground city on Turkana IV, such as the three small green maps and the large colorful map seen in these shots. 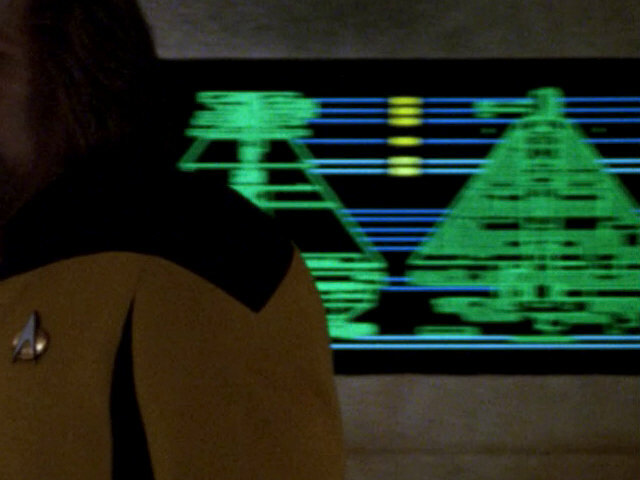 Owing to the motion blur, we can't recognize more on the green display in HD. 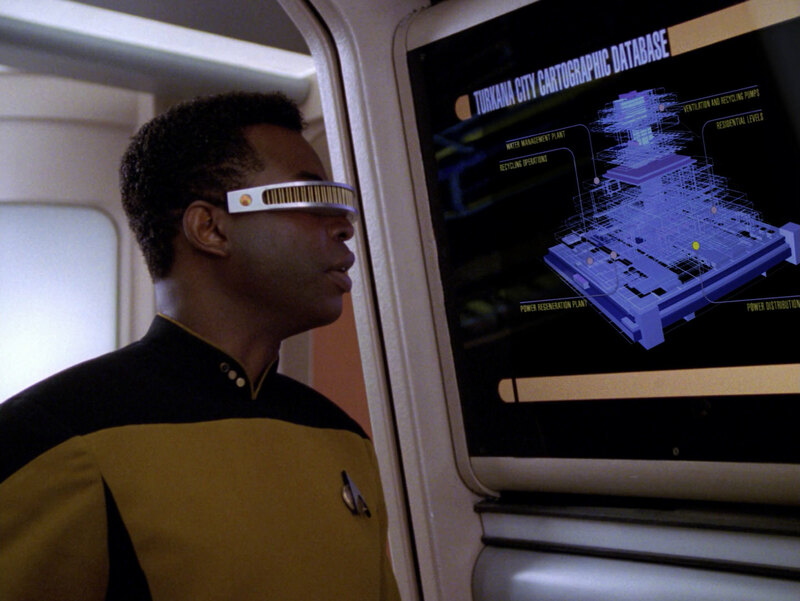 Ishara Yar gives a unique data chip, containing maps of the Turkana IV tunnels, to Data. A better look in HD. 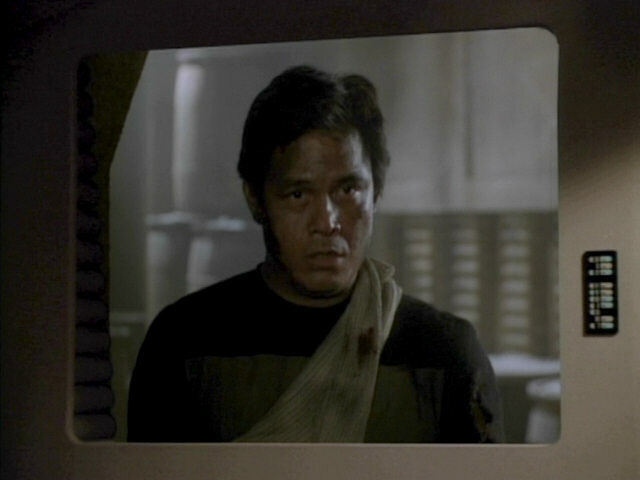 Tan Tsu, serving aboard the human freighter Arcos, wears a unique uniform only seen in this episode. 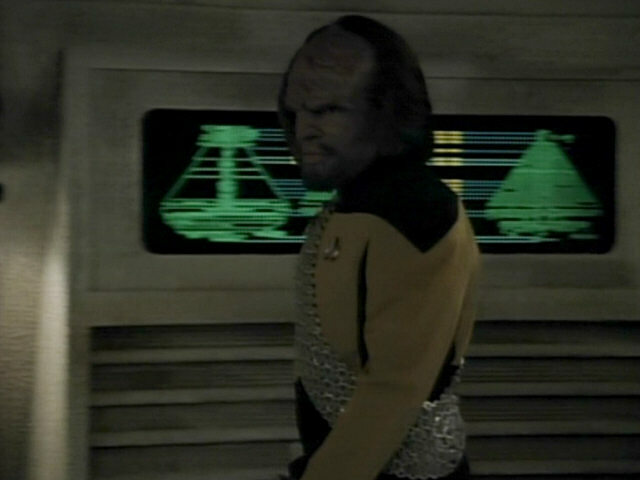 The uniform in TNG-R.
Another map of the Turkana IV tunnels seen several times in this episode. An HD look at the unchanged display. Note the pixelated letters. 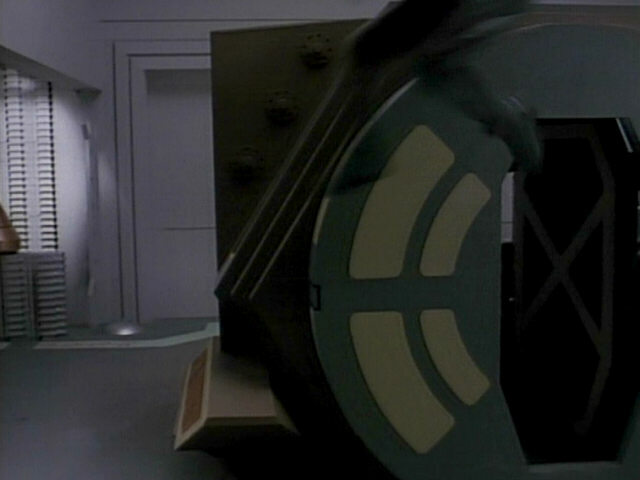 The Arcos escape pod is a re-use of the Zibalian escape pod, created for "The Most Toys", which also appeared, in modified form, as the Zalkonian escape pod in "Transfigurations". 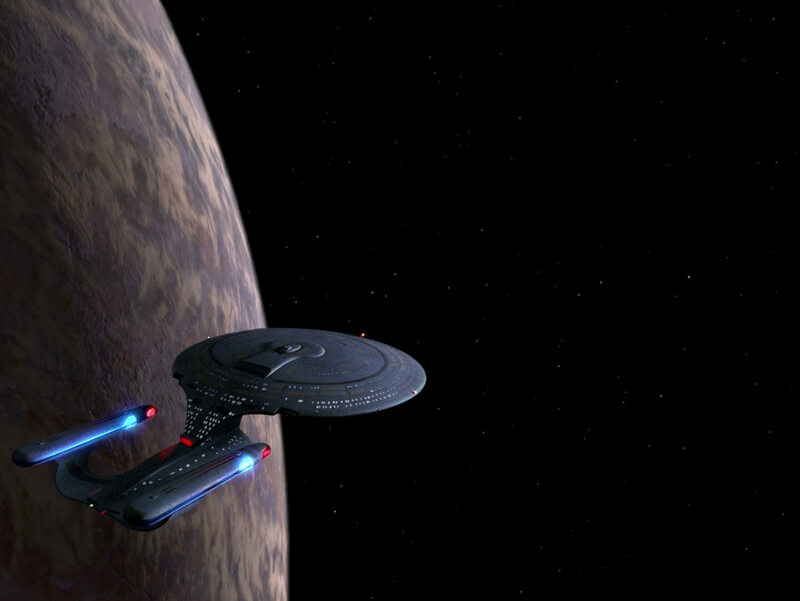 "The Most Toys" A better look at the escape pod in HD. 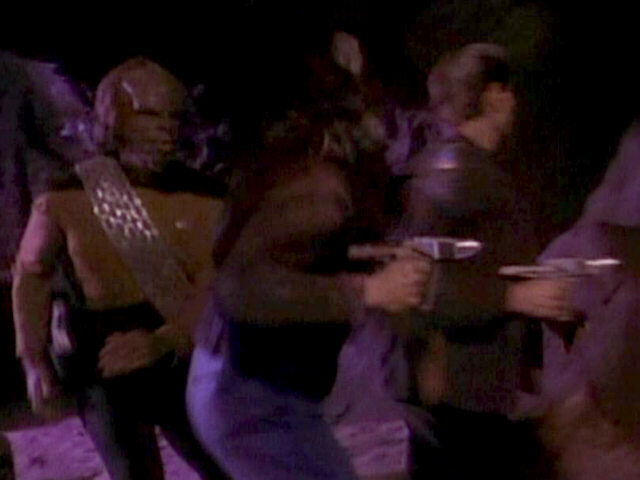 Apart from two types of small pistols, the humans on Turkana IV also use Klingon painstiks (first seen in "The Icarus Factor") as weapons. 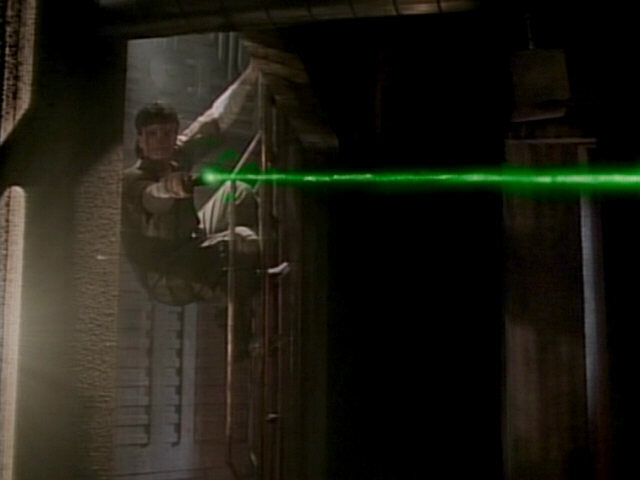 In contrast to the Klingon weapons, the painstiks seen here actually fire green phaser beams. The second pistol used by the Turkana IV inhabitants was originally created for "The High Ground", where it was used by the Ansata terrorists. 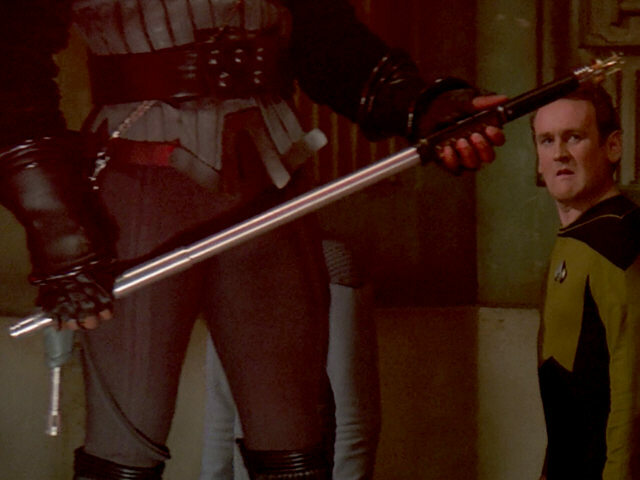 This weapon is one of the most often re-used weapons on Star Trek. 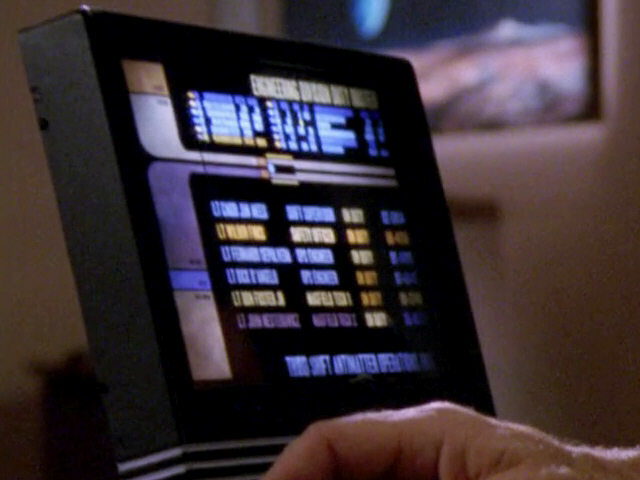 In SD, the text displayed on Picard's desktop monitor is unreadable. 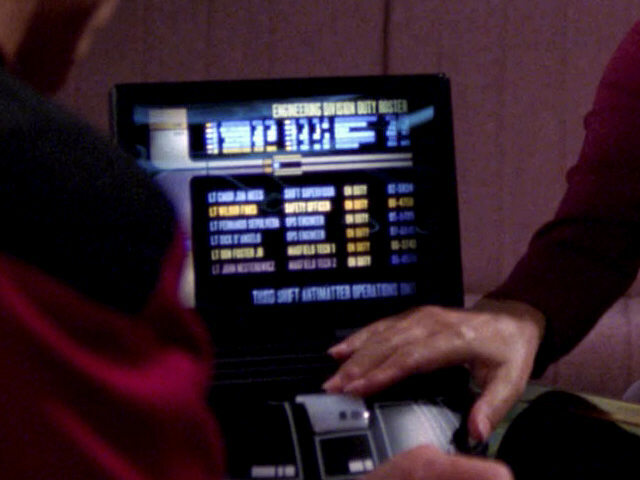 Human HD" In HD, we can identify the display as the "Engineering Division Duty Roster" from "Suddenly Human", with names of people involved in the Star Trek production. 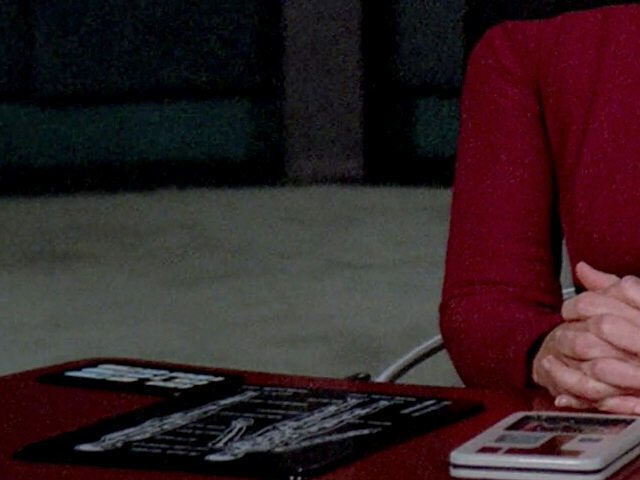 Dr. Crusher is seen reading from a transparent PADD in this scene. 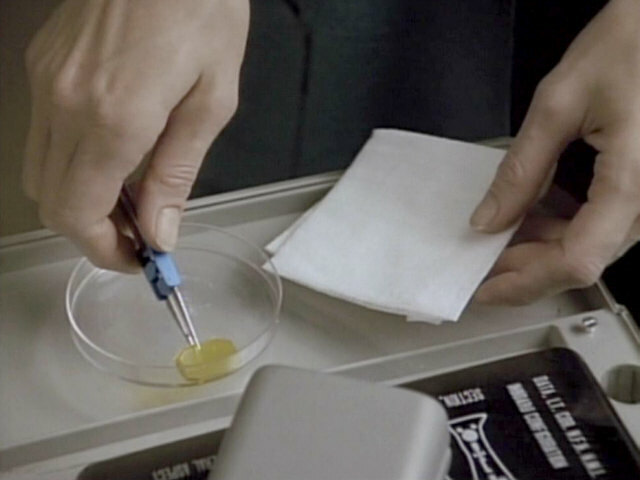 These rarely seen PADDs first appeared in the season 1 episode "Symbiosis". 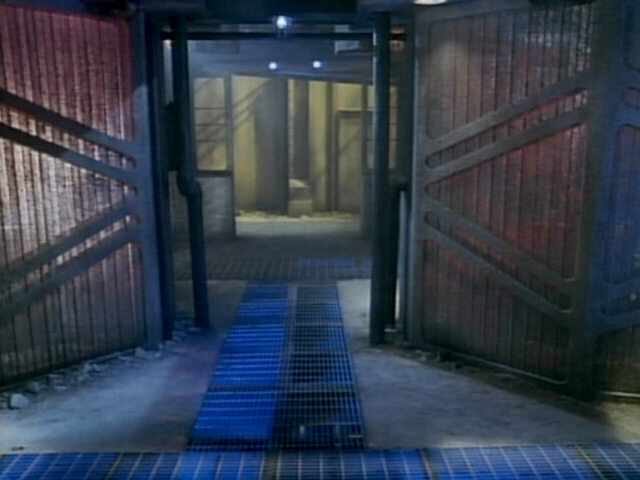 The panels visible in the corridor outside sickbay are different than in other episodes. 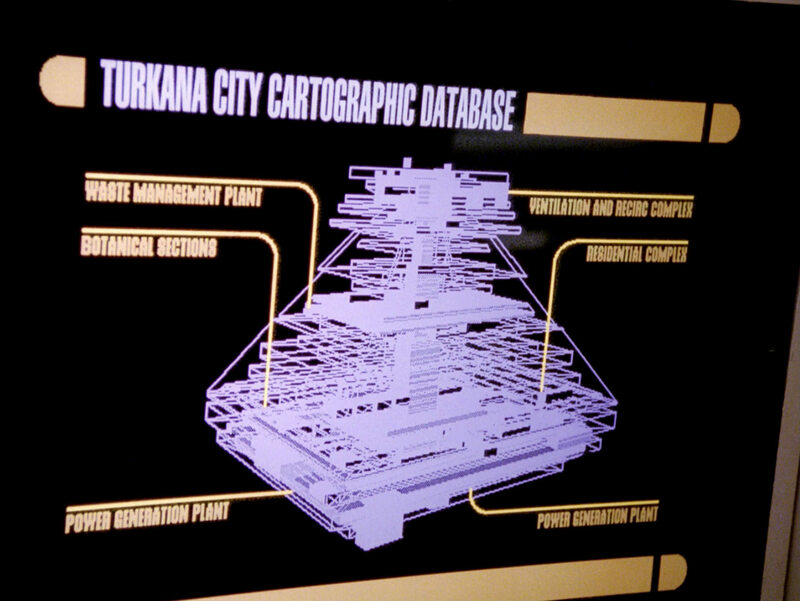 Here, the previously seen map of the Turkana IV tunnels shows up on a bridge aft viewscreen. 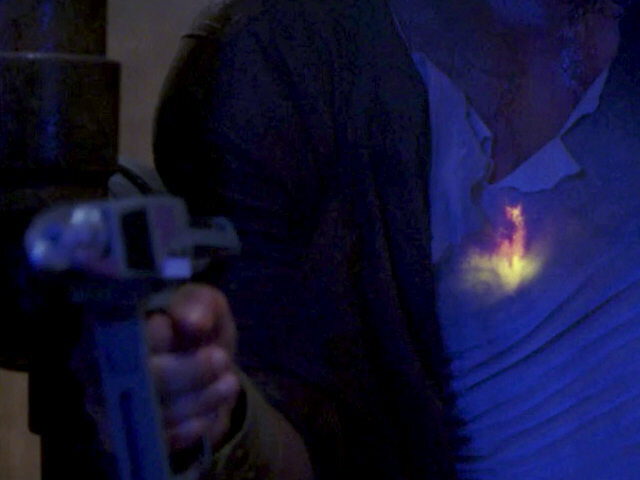 A flashing location marker was added for this shot. 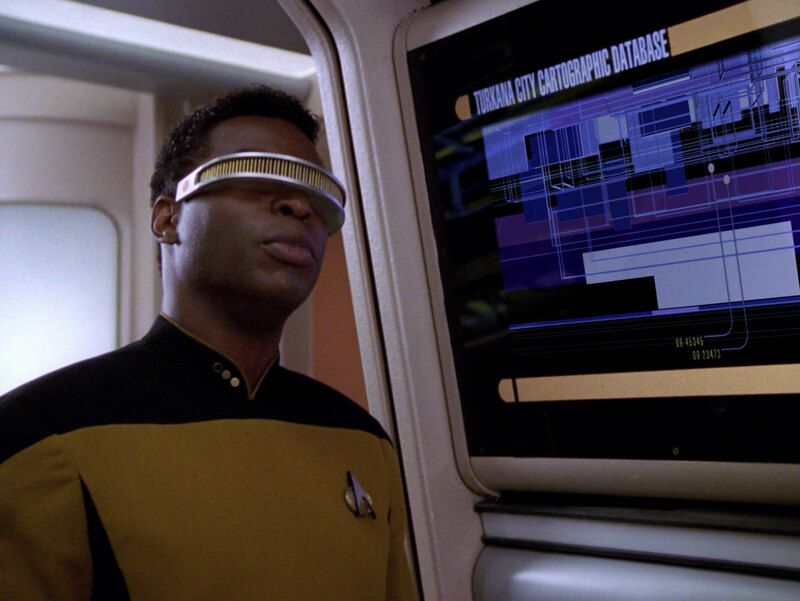 An HD look at the unchanged display. Geordi is looking at an animated version of the above map. 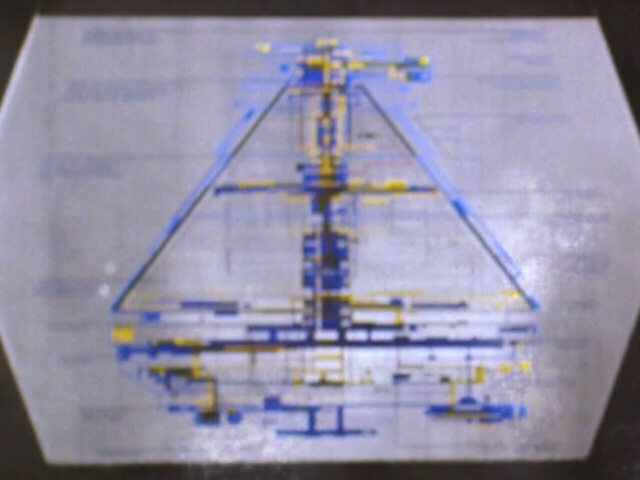 In all earlier scenes, the map was realized as a practical effect on set. In this shot, however, the animated map was added in post production. 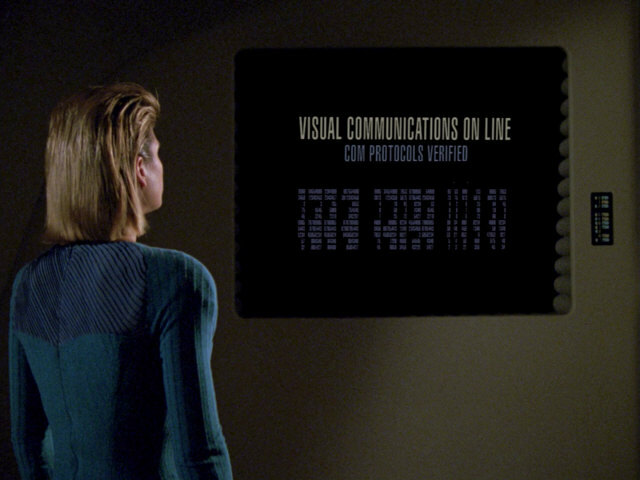 The labeling on the animated graphic was changed for TNG-R. 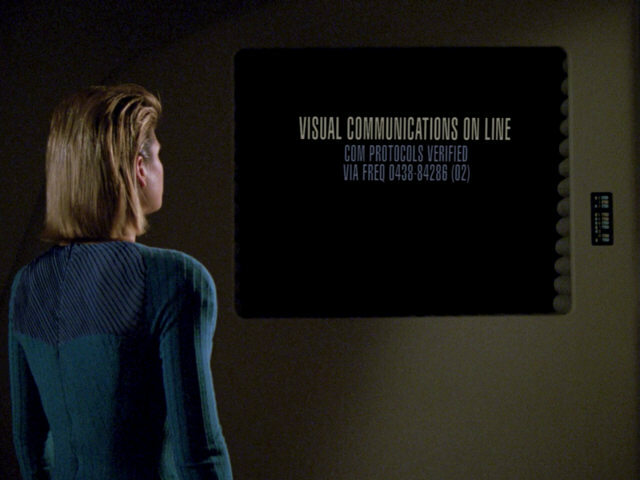 In the original episode, the labeling on the static and animated graphic was identical. 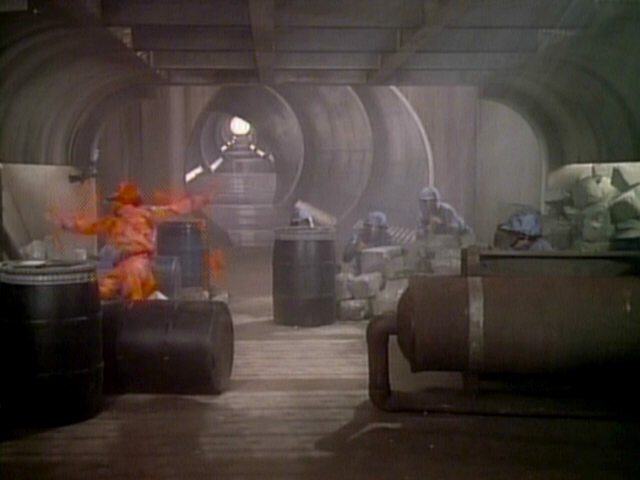 In TNG-R, the water management plant has become the "waste management plant". The botanical sections are now "recycling operations". The power generation plant in the bottom left corner has become a "power regeneration plant". The ventilation and recirc complex are now "ventilation and recycling pumps". The residential complex have become "residential levels" and the second power generation plant (bottom right corner) a "power distribution [something]". The new variety in the animated graphic is nice. 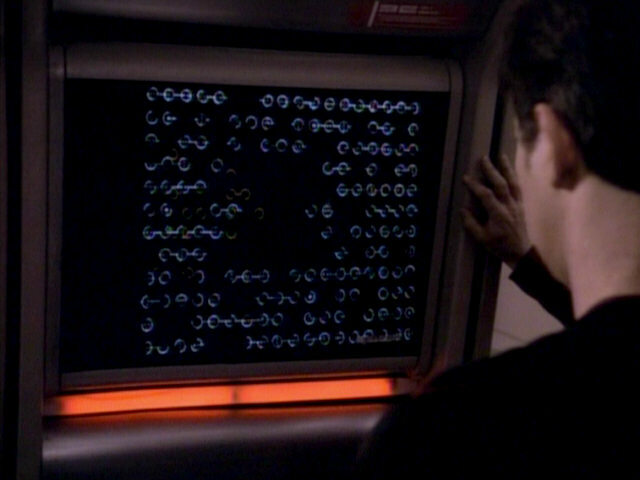 The problem is that the static graphic (lowermost cap) is also legible in HD now and still contains the old labeling, identical to the labeling of all the close-up shots of the graphic seen earlier. This is the first time this display located close to the "pool table" and the corridor passing in front of the MSD in main engineering is used. 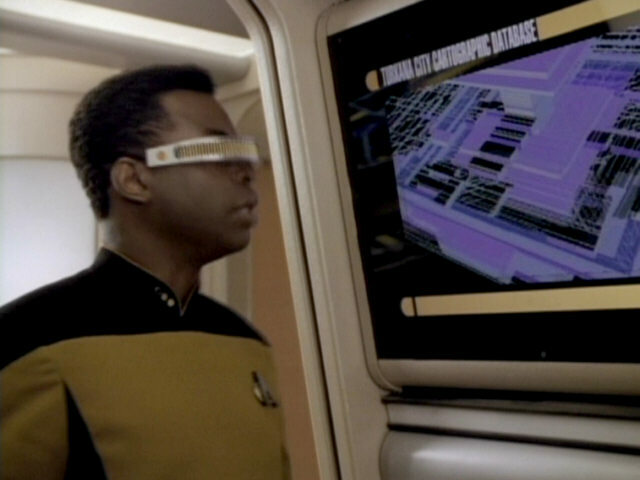 Normally, the back sides of isolinear optical chips are located here, as can be seen in the screenshot from the previous episode. 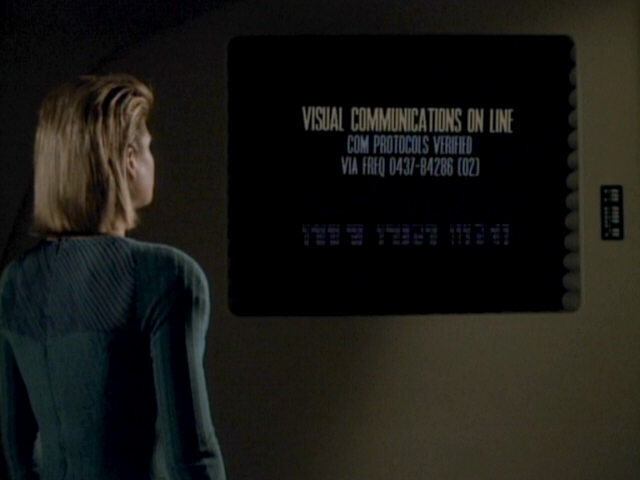 The display on the opposite side of the set displayed Bynar writing in "11001001". 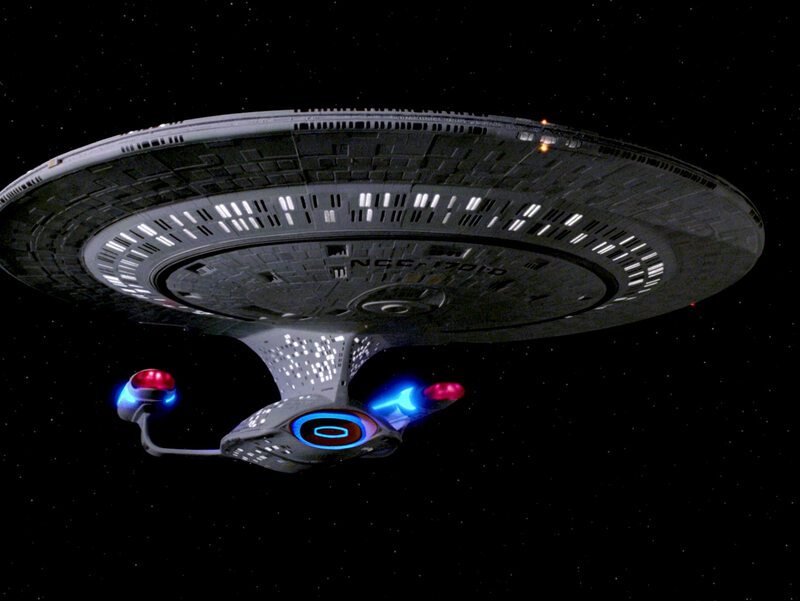 The LCARS display is a practical effect in this shot again. 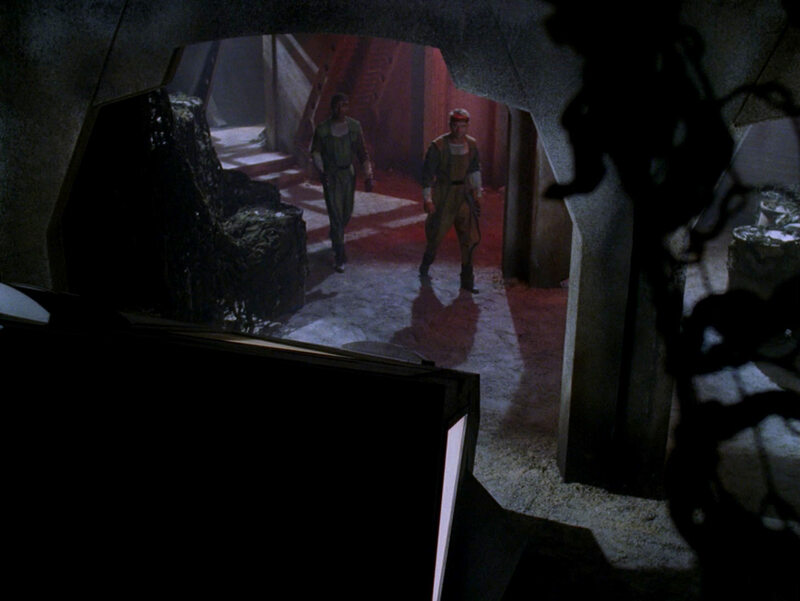 "Remember Me" The shot as it looks in TNG-R.
Another look at Turkana IV. 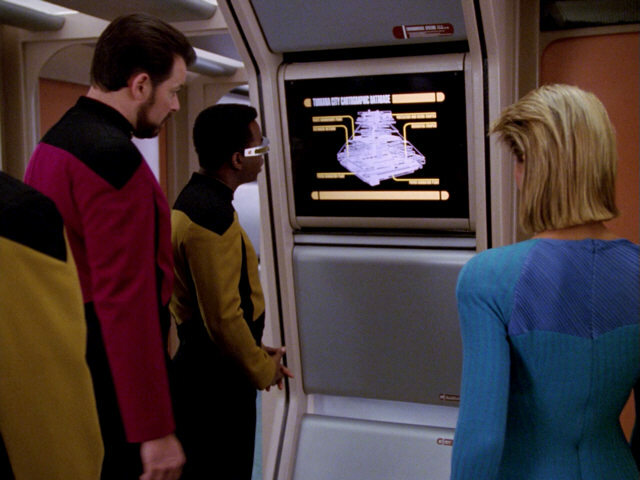 The recomposed shot in TNG-R.
An LCARS display is briefly seen before Ishara Yar establishes contact with Hayne. 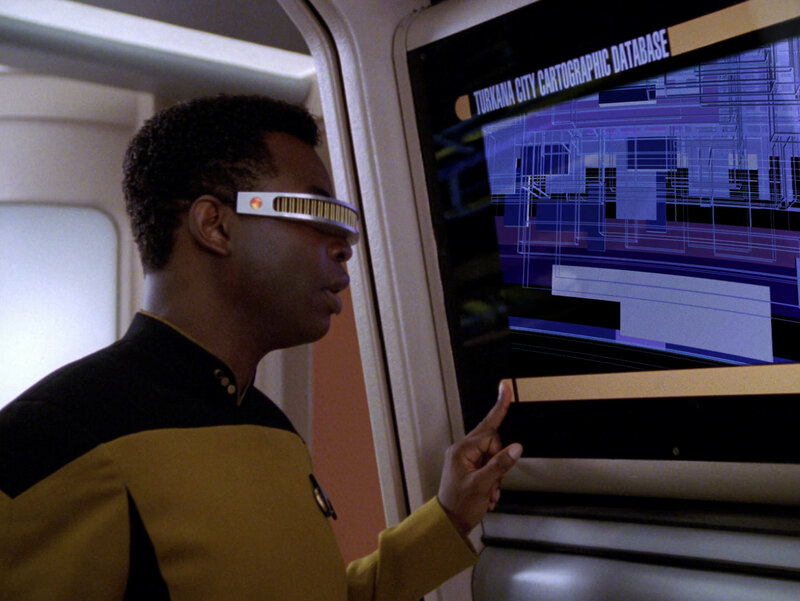 The screen display was newly created for TNG-R. 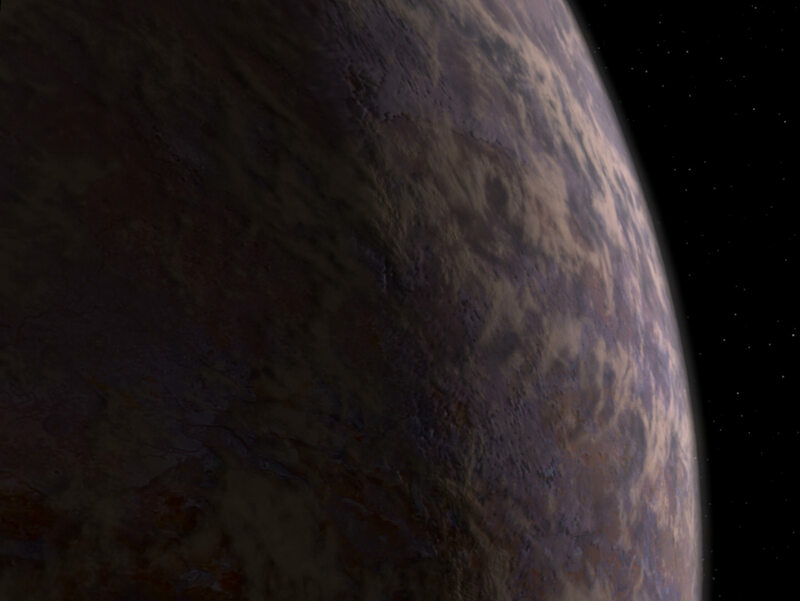 The frequency is now 0438 instead of 0437. 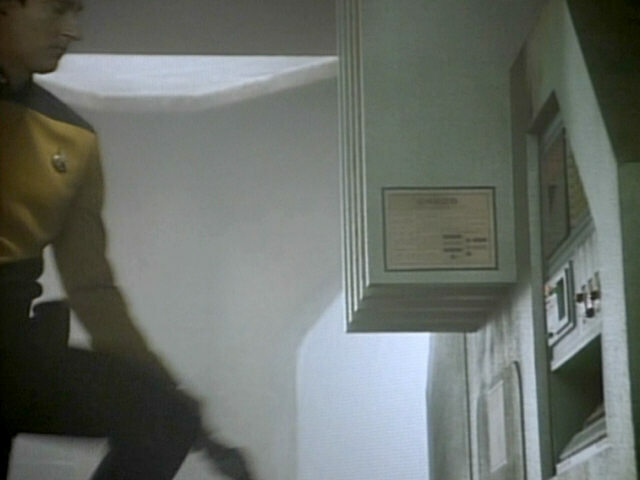 Doctor Crusher has just removed Ishara Yar's proximity detector. 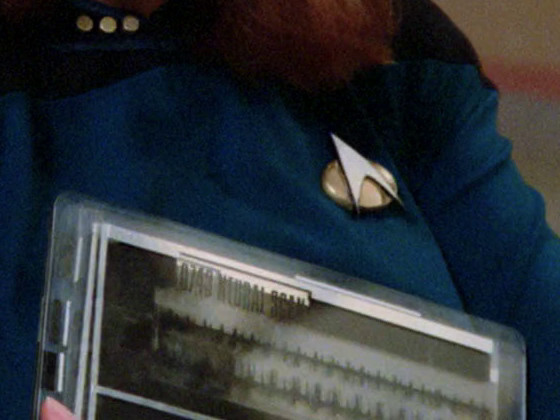 The bottom left corner of a black PADD with the words "Data, Lt. Cdr. N.F.N N.M.I" can be seen in the screenshot. 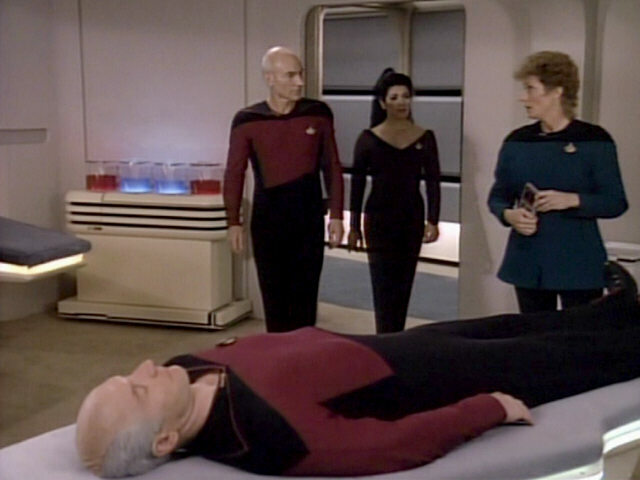 This PADD was originally created for "The Measure of a Man". 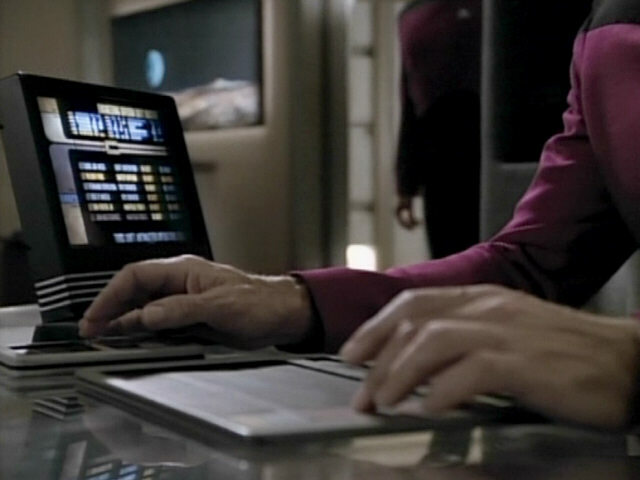 of a Man" HD A good look at the device and the PADD in HD. 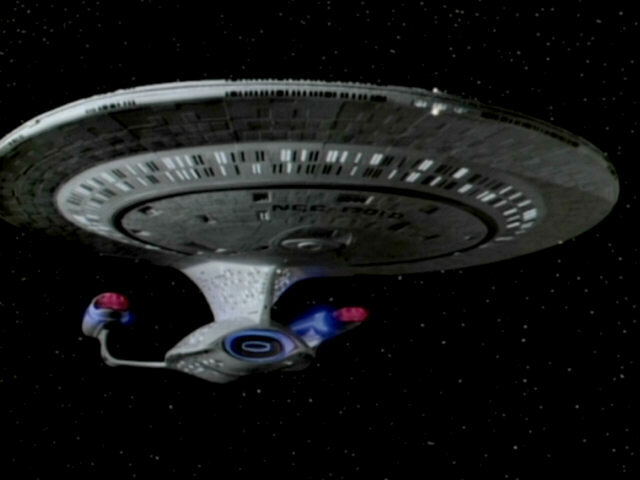 This shot of the 4-foot model of the USS Enterprise-D was originally created for "The Hunted". 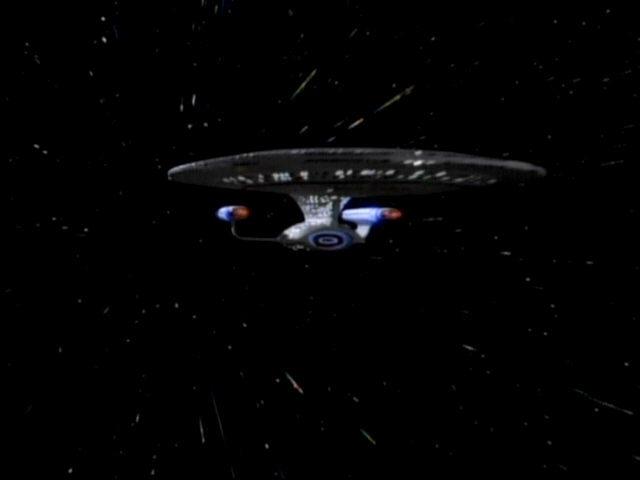 Here it appears for the first time unobstructed by another ship. 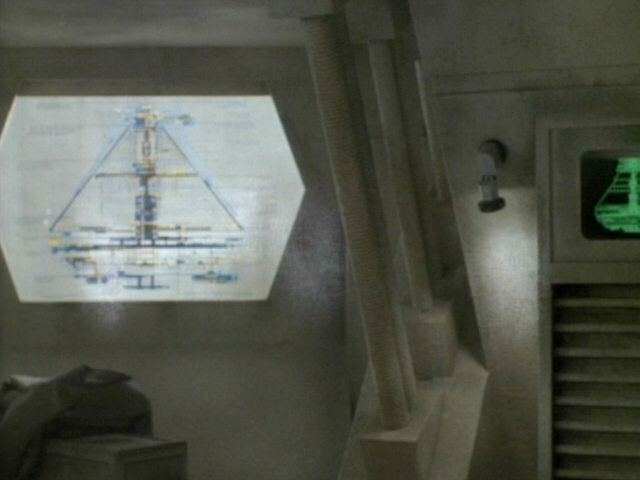 In the earlier episode, the Ten Forward windows, unlit in the 6-foot model, were hidden behind the Angosian ship. Here, the lit windows can be fully seen. 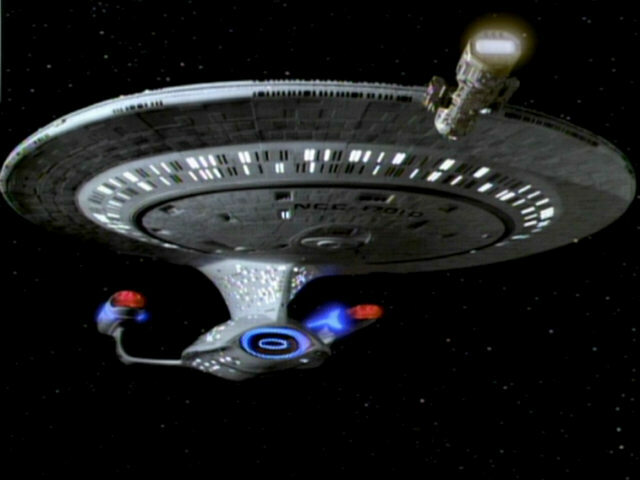 "The Hunted" The fat hull plates of the 4-foot model as they appear in HD. 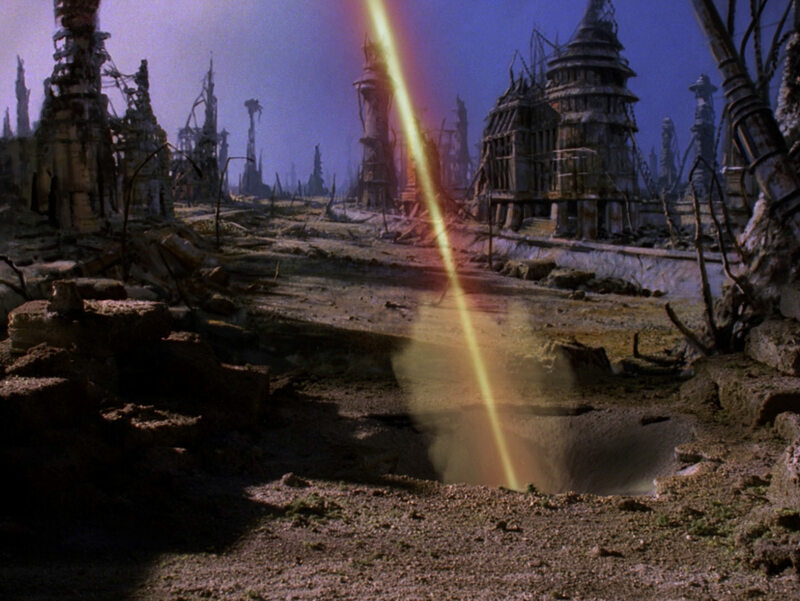 A phaser beam drills a hole into the surface of Turkana IV. 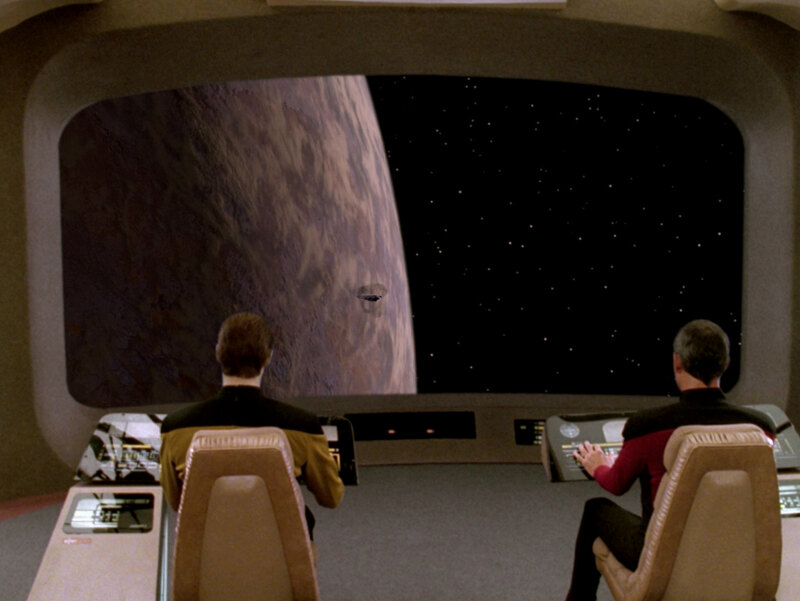 The reconstructed shot in TNG-R. 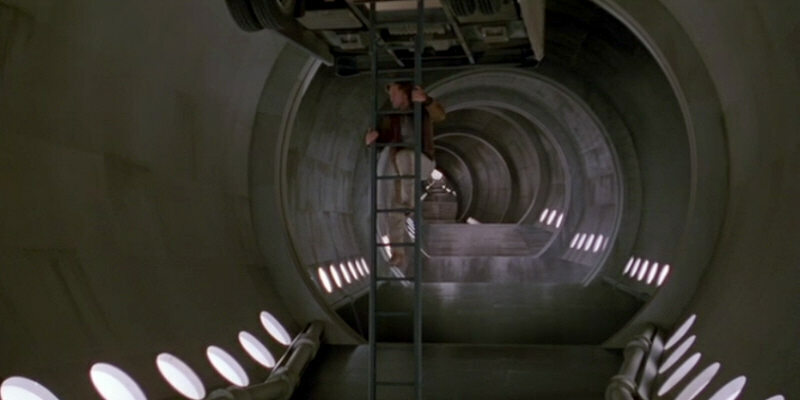 The tunnel extension seen here was originally created for the movie "Spaceballs". 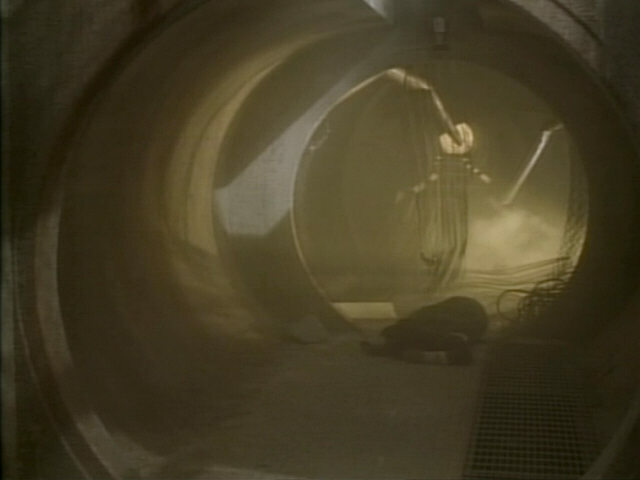 It also appeared in the season 1 episode "Too Short a Season" on Mordan IV. 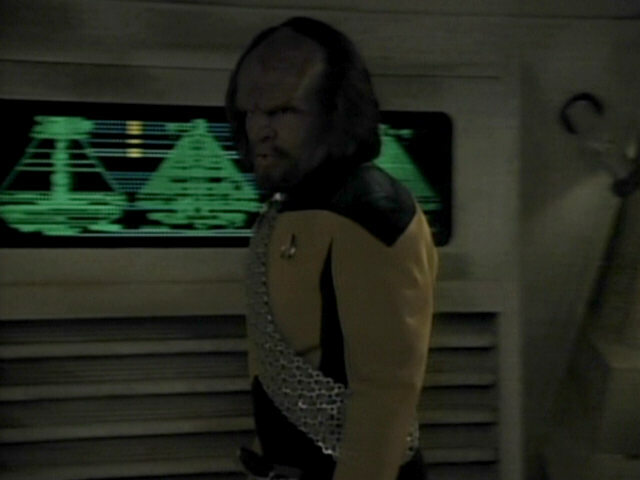 Another look at the unique uniform worn by the Arcos crew members. 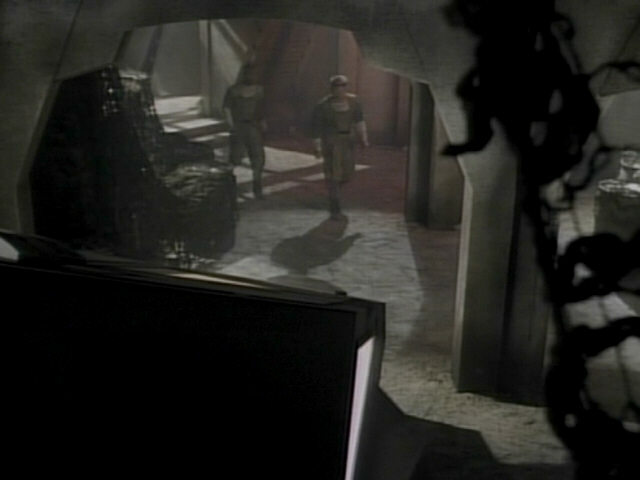 While almost all shots in this episode were darkened even at the expense of overall contrast, this one is brighter in TNG-R than the original. 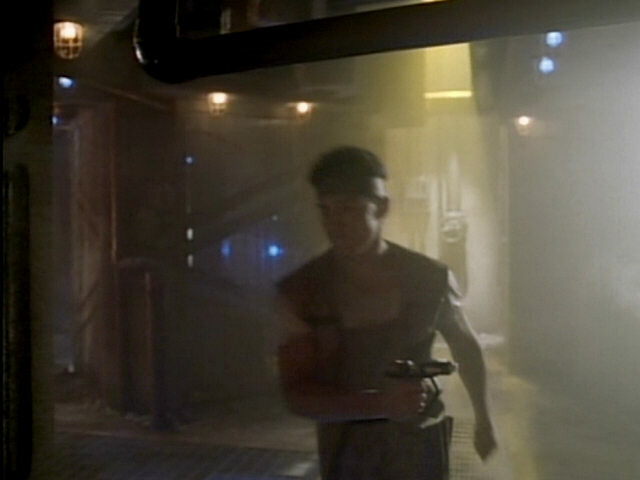 A weak phaser beam is used to destroy the handcuffs of the Arcos crew members. The handcuffs seem to consist of a 20th century cable with coupler. 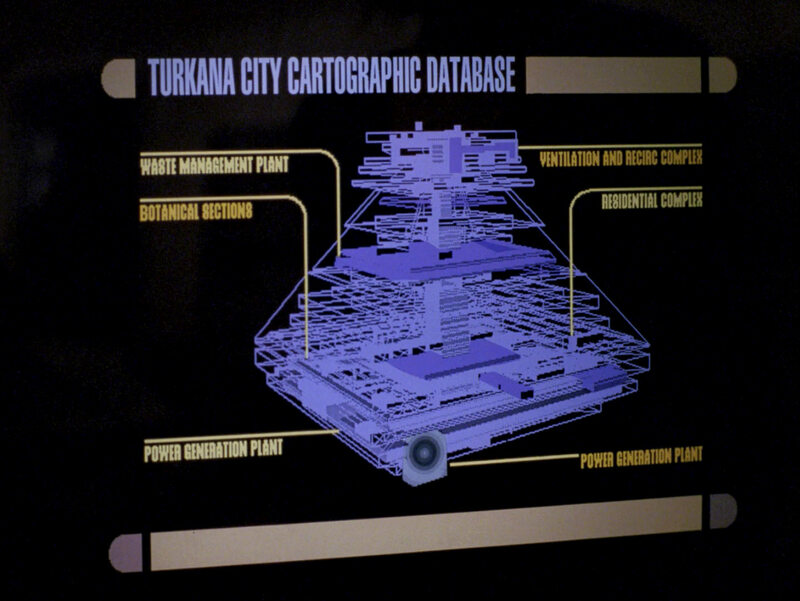 The power core of the human colony on Turkana IV. 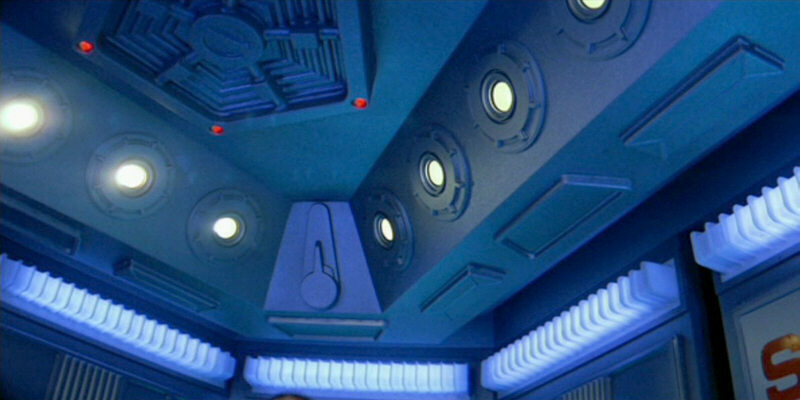 The triangular roof of the power core is another re-use of the turboshaft roof created for "Star Trek V: The Final Frontier". "Star Trek V" In HD, the text on the door can almost be read. 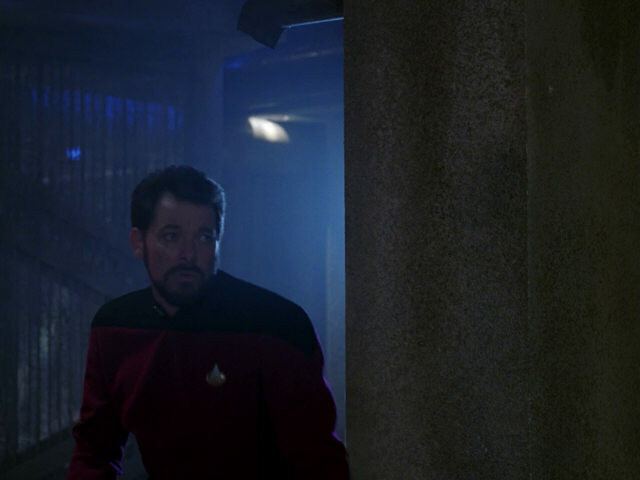 Also note how much darker the scene is in TNG-R. 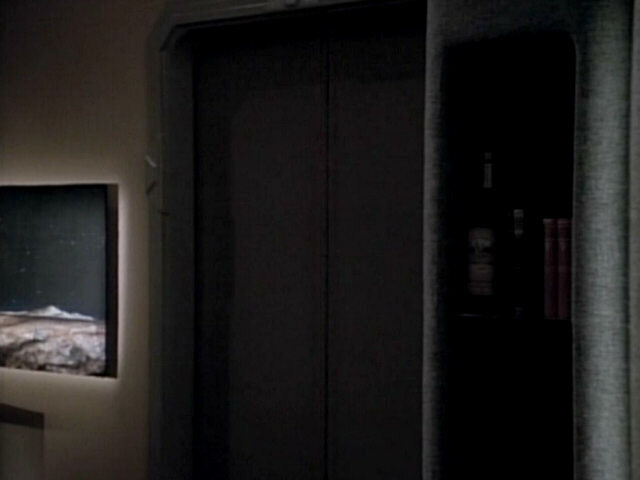 Watching this scene with the Blu-ray player, the difference between the dark and bright scenes is not quite as harsh as on our screen caps though. 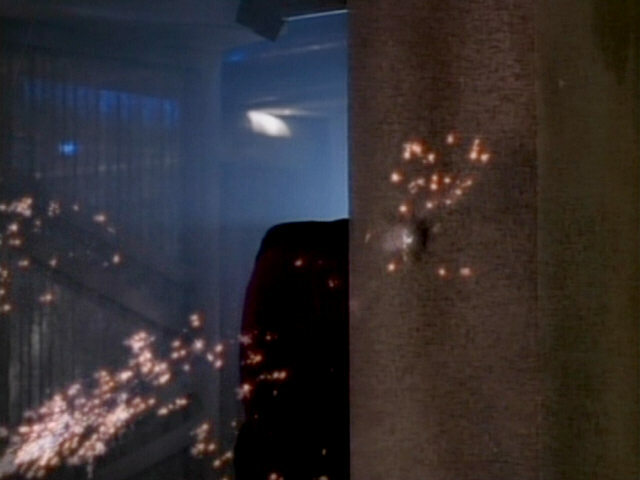 Ishara Yar fires her phaser at Riker and the black phaser burn can clearly be seen in the shot. 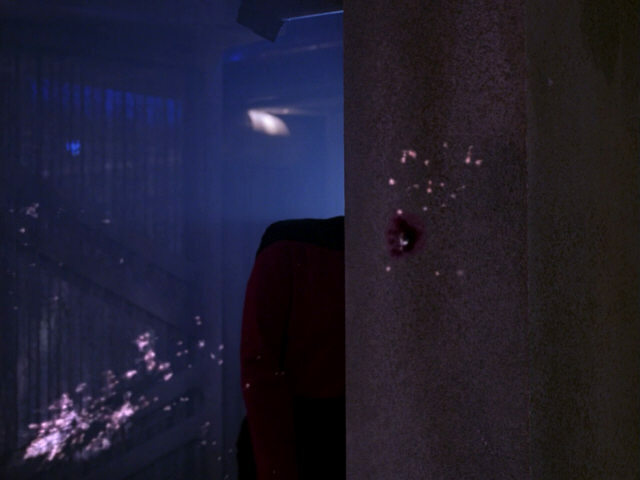 A few seconds later, after Riker has stunned Ishara, the phaser burn has completely disappeared. 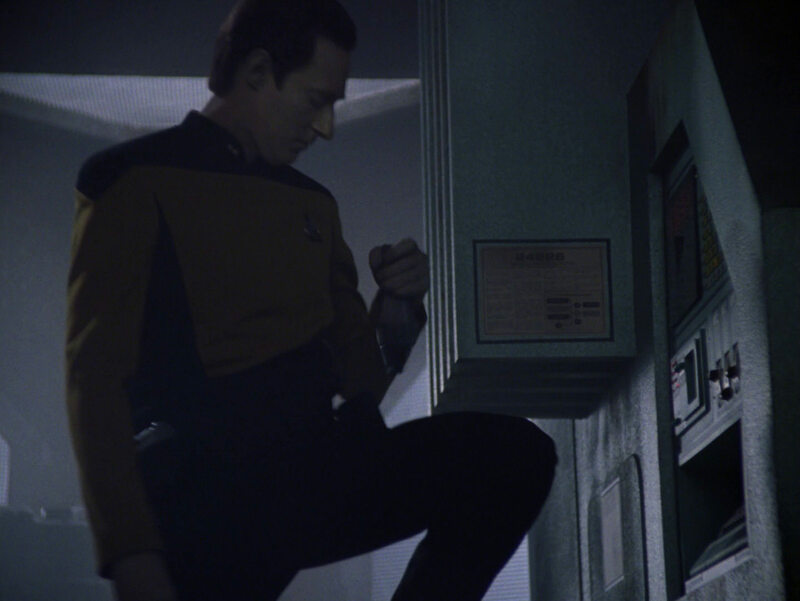 The small blooper was not fixed for TNG-R. 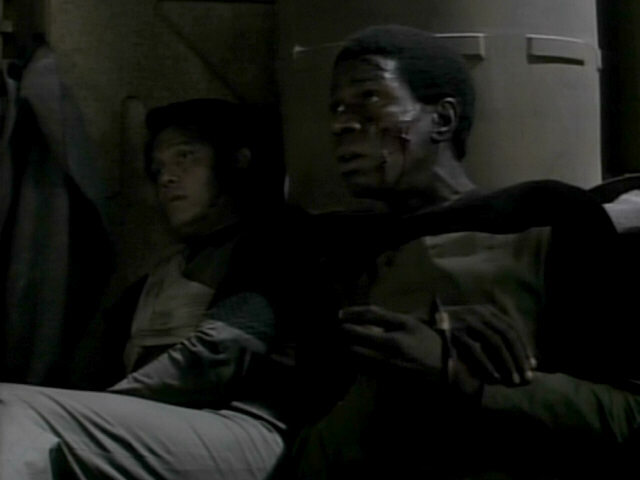 These shots too are very dark. Turkana IV almost fills the whole screen in this shot. 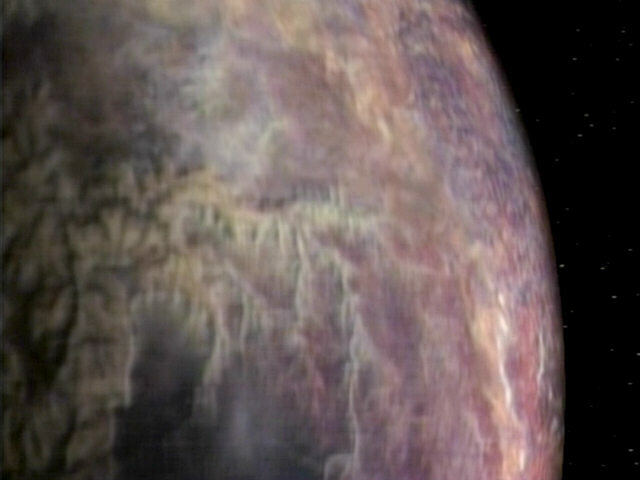 A good look at the planet in HD. 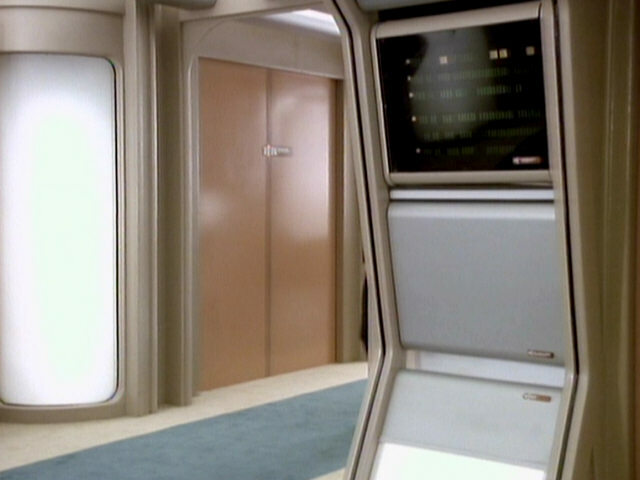 Thanks to Christian of Star Trek HD for the hint about the corridor panels.